We arrived at Enderbury early on Wednesday morning, our first stop within the Phoenix Islands. Of the four islands we will visit, Enderbury stands out as different in many ways. Kanton, Orona, and Nikumaroro are all circular atolls with small land area and large lagoons in their centers, connected to the ocean by channels. Enderbury is much less expansive, spanning approximately three miles long by one mile wide and has just a very small isolated lagoon in its center. Enderbury also has continuous reef around it without any breaks and like all the Phoenix Islands, rises steeply from the deep, making anchoring difficult and landing hazardous. Because of the conditions, most of us had to stay on the boat, never getting in the water or on the island. Sitting less than half a mile away from Enderbury on our ship, the island was tantalizingly close. besides a few dense patches of shrubs and a couple of palm trees. However there was still plenty of activity around the island that we could experience fully. Enderbury is one of the most important bird islands in the area, home to 10,000 breeding pairs of birds of a variety of species. Clouds of hundreds of sooty terns with a few red-tailed tropicbirds sprinkled in were a constant over the island. We observed kleptoparasitism by frigatebirds at its finest, where instead of fishing themselves, they chase and harass other birds so much that they vomit up their food for the frigatebirds to eat. Noticeably absent though were petrels and shearwaters, birds that burrow in the sand to make their nests and are especially vulnerable to rats. In 2011, rats were eradicated from the Enderbury, so we expected to see more of these species around the island. We were able to get our two representatives from Kiribati when we went onto Enderbury to do ecological survey work, swimming over the reef to get there. They did hermit crab surveys traversing up and down the island, and recorded counts of vulnerable bird species. But most notable about their visit was the unexpected presence of rats, which had been sighted post-eradication in 2012, also. Their impact on vegetation and seabirds was obvious, and the rats themselves were seen every five or ten minutes. It seems that while initially the population of rats declined after the eradication, it went back up to a high level pretty quickly. This disappointing news explained the absence of the petrels and shearwaters on Enderbury, but hopefully we are able to see more of them at our other stops. Encouraging though was that masked boobies, another ground nesting species is thriving on Enderbury despite the rats. The other party that was able to venture off the ship was our two shark researchers from Woods Hole Oceanographic Institute. They caught many species of reef sharks, almost reaching their high quota for the island. The big excitement was when an especially large grey reef shark thrashed around and punctured their inflatable small boat. They had to rush back to the ship as it was deflating, and by the next day it was all patched up. The report of the reefs themselves is that the reef is very healthy with almost no signs of coral bleaching. 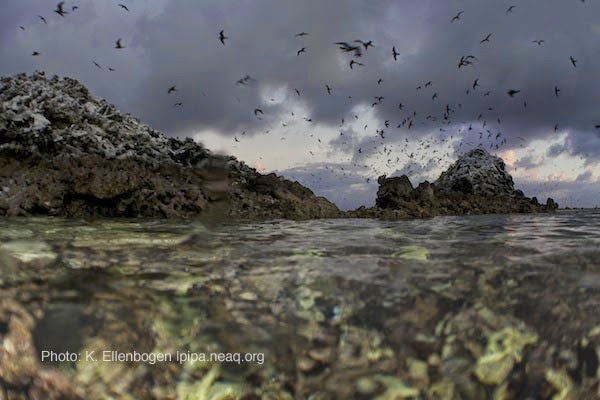 The reef around Enderbury is an outlier from the rest of the reefs in the Phoenix Islands, being very flat with little vertical buildup of coral. So the most spectacular reefs are still to come. 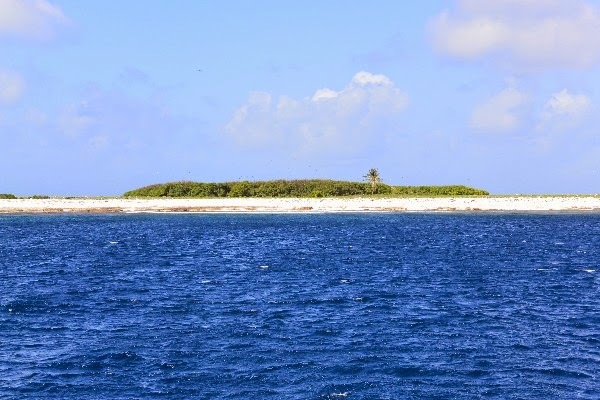 After finishing up our research at Enderbury and with no signs for the rest of us to snorkel and explore the island, we left a day early for Kanton, the only inhabited island in the Phoenix Islands. It lies only 40 nautical miles from Enderbury, but we detoured out the way to pass over a seamount and do our full series of deployments around it. Currently we sit anchored off on Kanton, having arrived earlier this afternoon. We will spend the next two or three days here, snorkeling in the lagoon, checking out the island, and talking to the local people about life in the Phoenix Islands.